The 4th of July brings about thoughts of BBQs, picnic foods, fireworks, and eating outside. The last thing you want to do on an extra day off is spend hours in the kitchen baking up tasty treats for your family. But that doesn’t mean that you can’t still whip up something extra special! Check out some of our ideas that we found for easy, simple, and semi-homemade treats for your 4th of July parties and picnics! I just love this idea from AThriftyMom.com! 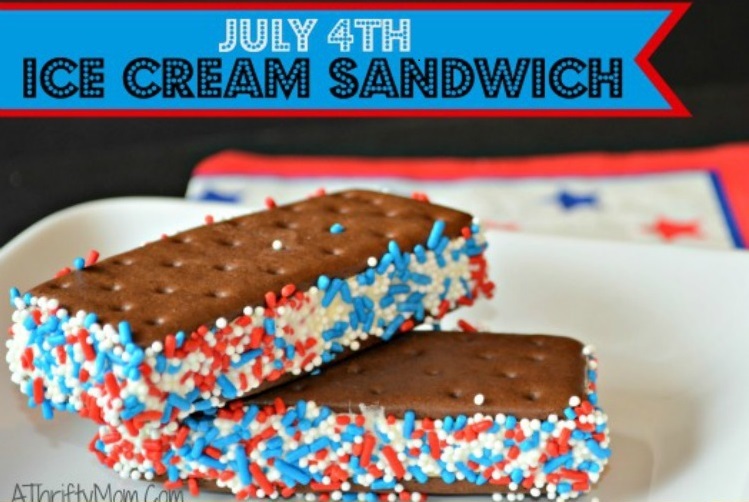 She just took store bought ice cream sandwiches and coated the edges with red, white, and blue sprinkles! Another idea is to cut the ice cream sandwiches in half before adding the sprinkles, then stick a Popsicle stick in each one to make them a little less messy. Mariah at Giggles Galore has two of my favorite EASY treats that are also a little bit more healthy – Patriotic Fruit Kebobs and White Chocolate covered strawberries. Using marshmallows, strawberries, and blueberries you can easily throw together some Patriotic Fruit Kebows. This is also a good alternative to fruit salad because you can eat it without a plate or even a fork! Pair some strawberries, white chocolate, and blue sprinkles and you have a very festive and tasty red, white, and blue treat! If you have a little bit of time before your party you could easily throw together these Fireworks Push-It-Up Cakes. I’d suggest baking the mini cupcakes ahead of time and just throwing them in the freezer until the day of the party. You can use premade frosting as the recipe suggests or make your own. Throw in some sprinkles and you’ll have a treat that everyone will enjoy! 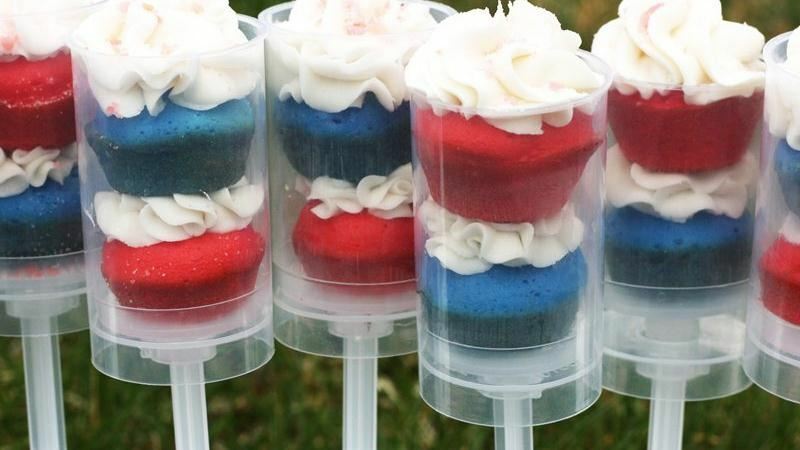 We hope this gives you a couple ideas for some fast and easy treats for your 4th of July bash (or any summer party)!